But the process of creating a lead magnet that converts, and delivering it to your readers isn’t that easy. And the unfortunate truth is that most lead magnets fail to convert any readers into subscribers. This post has you covered! You’ll learn the key components of a successful lead magnet, ideas and examples to help you get started. Along with exactly which tools can help you create, host and deliver your lead magnet. 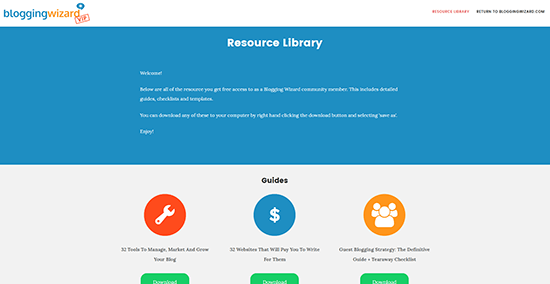 Blogging Wizard subscribers get access to two free lead magnet templates inside our resource library. Along with a bunch of other helpful guides/checklists etc. Want in? Sign up here. Most websites offer no incentive to encourage people to join their email list. Unless your site is a top-tier publication in your industry, you’ll likely see conversions below 1%. But, when you use a lead magnet you could see conversions jump to anywhere from 2-7%. If your offer is especially good, you could see even bigger conversion increases. That’s a nice improvement right?! Lead magnets work well because people love to get free stuff – especially exclusive stuff that fulfills a need. It could be a free guide, a checklist, discount code or something else. The type of lead magnet you choose and how you position it will have a significant impact on your conversions. So, before we look at how to create yours – I’ll talk you through what makes a great lead magnet. You may have come across the term ‘content upgrades’ before. These are simply post-specific lead magnets. Some of what we’ll discuss will cross into content upgrade territory, but for the purpose of this post, we’ll stick to using the terminology of lead magnet. You can’t offer any old ‘thing’ as an incentive for your readers to join your email list. Your readers will likely read a bunch of other sites in your niche that offer some sort of lead magnet. And you want them to join your email list instead right?! So what goes into the recipe for an epic lead magnet? Before you think about what your lead magnet should be, or plan any of it out – you need to understand exactly what you want your lead magnet to help you with. Think big picture. What do you want people to do after they subscribe? Maybe you want to promote a service, or a paid product? Whichever it is should be the logical next step once subscribers have digested the info in your lead magnet. Sure, a 250-page ebook might sound good but will your subscribers read it? Probably not. When your lead magnet is concise, you increase the likelihood that your subscribers will use it. Whether your lead magnet is a checklist, guide or a discount code – your subscribers need to get everything they need to take action right away. There are several problems your ideal reader is facing right now. Your lead magnet should solve one of those problems. Not sure what those problems are? Ask them! All it takes is to put together a quick survey using a tool like Typeform (the free version will be all you need). Send the form to your email subscribers and social media followers. If you need more responses, try hunting around for an online community where your ideal reader hangs out. Broad lead magnets are a dime a dozen. So to stand out, you need to get specific. But not so specific that you focus on a sub-topic that only a handful of people care about. You may find it helpful to incorporate the top level topic into the headline. Now, imagine reading that if you knew nothing about specific list building strategies. The headline makes it clear that the post could help you grow your email list. Will people find your lead magnet useful? Does it have purpose? There are exceptions to this factor but if you’re in the business of educating rather than entertaining (or focusing more on educating) – you need to be able to answer yes to the two questions above. Readability and user experience is a big deal. For example, if your lead magnet is a short guide – don’t display a wall of text. Leverage formatting such as bullet points, shorter sentences, imagery, sub-headings, etc. And ensure that you optimize your text for scanners – those who will skip down the page until they find a heading or snippet of text that jumps out at them. PDF guides are one of the most popular lead magnet types, but you can do so much more. In a moment, I’ll share several ideas that aren’t talked about too often. This isn’t an exhaustive list by any means – the aim here is to show you what’s possible. If you don’t have much expertise in your chosen niche, don’t worry because there are ways to get around that. How exactly? Leverage the expertise of others by doing video, audio or even text-based interviews, or curating a collection of resources together. Cheat sheets can work well because they’re designed to be direct and to the point. With the right formatting and actionable info packed in – they can be extremely valuable & make it easy for your subscribers to use on a regular basis. And remember – the more your subscribers use your lead magnets, the more memorable you become. 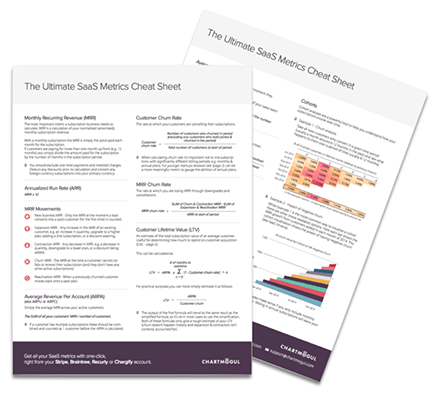 This cheat sheet is easy to follow, includes plenty of data, and it’s actionable. And the topic is on point. Presentations are easy to digest and offer the added bonus of leveraging SlideShare’s built-in audience of 70 million+ users. A while back, we re-purposed a guest post published here on Blogging Wizard into a presentation and uploaded it to SlideShare. A CTA to drive traffic back to Blogging Wizard. A direct CTA to our main offer; 15+ guides, checklists, and templates to help bloggers get more traffic and email subscribers. We didn’t intend for this to be a lead magnet – it was created as a trial exercise for one of our team. If you try this – I’d recommend using SlideShare’s lead generation slide to encourage even more email sign ups. You can also offer your presentation on your website as a PDF download. If that’s the case, you’ll want a PDF version that you can create with a tool like Google Slides (free). Don’t worry about how to host your PDF – we’ll talk about that later on in the post. People are busy – that’s a fact. Most people don’t have time to hunt around for the latest articles covering the topics they care about. Hiten Shah; co-founder of Crazy Egg runs a newsletter called SaaS Weekly. I don’t run a SaaS (software as a service) business, but I still find a few unmissable articles in each newsletter that I’d never have found without being a subscriber. You could use a regular email marketing platform like MailChimp or GetResponse for this or even a more feature-packed marketing automation tool – or you can use a purpose-built tool like Curated (this is what Hiten uses). Part of the benefit of using Curated is that it helps you streamline the process of curating articles into your newsletter – the time-consuming part. You can then import your subscribers into any other email marketing platform. I recently came across a platform called Revue which offers similar functionality. Viral quizzes are great for social media traffic. But did you know they can also be used for list building? Most quizzes are designed to entertain and create a sense of curiosity like Afar.com’s “What kind of solo traveler are you?” quiz. 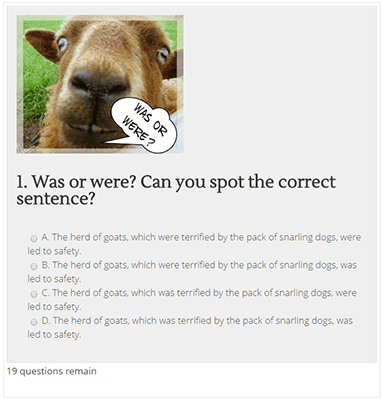 Other quizzes come from an educational standpoint like this quiz about common grammar mistakes by WriteToDone.com. The challenge with this type of lead magnet is that most quiz tools are only designed to encourage social sharing, and not build an email list. Interact – A SaaS app designed specifically for creating quizzes. You can sign up for a free account to test it out, but the lead generation feature requires a paid plan which starts at $29/month (when paid annually). You get access to a library of templates to inspire you and you can embed quizzes on any website you like. You can also run lead generation giveaways. Most popular email providers are supported. Thrive Quiz Builder – This WordPress plugin is ideal for quizzes and personality tests. You can use it to grow your email list, and/or drive social media traffic. Create dynamic quizzes with the built-in visual quiz builder and display different questions based on previous answers. Split testing is built into help you increase conversions, and in-depth analytics give you the ability to monitor conversions & shares, as well as see where people drop off from your quiz. An alternative option would be to use a regular quiz tool, then add a CTA below the quiz with a list building tool like Thrive Leads. This is what the team at WriteToDone did for their quiz (pictured above) – their CTA offered a PDF guide that was relevant to their quiz. Podcasts are all the rage right now. And offering a PDF transcript of your podcast is a great way to increase the lifespan of your existing content. We’ll go into more detail about delivering lead magnets later on, but James uses a Leadbox powered by LeadPages to power a clickable popover. Leadpages also has a digital asset delivery feature that can be used to send the PDF to your new subscribers. This can also be achieved with a WordPress plugin like Thrive Leads which is more cost effective. 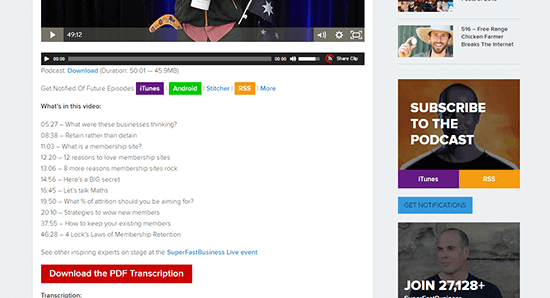 What if you didn’t want to create a PDF transcript of each of your podcast episodes? You could pick out some of your best podcasts and bundle them together in a PDF. Be sure to include complete transcripts and links to the audio/video for each one. Don’t have your own podcast? No problem – you can still use a variation of this technique. Reach out to a bunch of the big names in your industry and invite them to participate in an interview on Skype. Record the interviews using one of these tools and bundle them together into a lead magnet. Exactly how you structure your lead magnet depends on what you want to do. You could make the audio/video & transcripts available to subscribers only. Or you could release the audio/video on your blog and other platforms with CTA’s (calls to action) to subscribe to your list and get the full PDF transcripts. You could even release them as a mini-podcast series on iTunes (and other platforms) – you’ve then got the option to reboot the podcast in the future. A great option if you want to expand your reach. Here at Blogging Wizard, we offer multiple lead magnets in the form of a resource library (or vault). Earlier we talked about how it’s important for a lead magnet to be concise. A collection of lead magnets isn’t concise as such, but it can include concise resources. For example, we include templates and checklists that are straight forward to follow so subscribers can get an immediate benefit. You’ll find detailed guides too – they’re not so concise, but they’re packed with actionable advice. Later on in this post, I’ll discuss some of the templates we offer in more detail because two of them relate specifically to lead magnet creation. The main benefit here is that the perceived value is huge. Want free life-time access to our resource library? Sign up via this page. Wondering how to create a page like this? I’ve got your back! I’ll discuss it in more depth later in the lead magnet delivery section. Do you sell products? They could be physical products or digital products. Either way, you can offer an exclusive discount code to encourage visitors to join your email list. I’m on the fence with offering discount codes because it has the potential to devalue your products, and maybe even your brand. So you’ll have to consider how your sales may be affected long term before trying this. I’m not a fan of webinars. Mainly because of how so many tend to be unhelpful pitch fests. But when you pack helpful and actionable information into a webinar, you have the makings of something worthy of your people’s time. Running a webinar means getting a specialist tool. You could use Google Hangouts for free but it’s not designed with list building in mind. Alternatively, you could use a tool like WebinarJam to power your webinar and build your email list straight away. 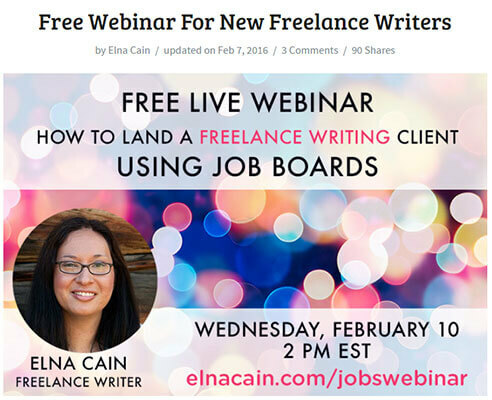 Then offer a recording of the webinar on your blog. You can use paid traffic platforms such as Facebook Ads to promote your webinar. But, I’d recommend using a dedicated landing page. Most landing page tools come pre-loaded with some sort of webinar template these days (so you can display a countdown timer). For example, a WordPress plugin called Thrive Architect comes with several templates. It has an entire set of templates that are designed to be used in a webinar style funnel. Customize the landing page to your branding, hook up your email marketing service and your landing page is ready to go. I haven’t seen many brands use this technique, likely because it takes a lot of resources to make it work. Kissmetrics run regular webinars with industry experts, and they make each one available on their ‘recorded webinars’ page. 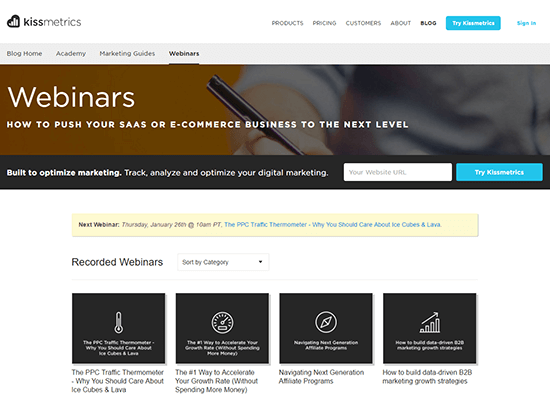 When a webinar is scheduled, a landing page is created where visitors can opt-in. It’s then added to the webinar page. Once the live webinar has finished, the landing page is edited, and the recording is made available via the same URL. This does mean that visitors have to enter their details for each page. However, a dedicated landing page for each one means you’ve got a specific URL to promote. It also makes segmentation far easier. Giveaways are popular in a wide variety of industries. When the ‘enter to win’ button is clicked, a simple opt-in form is displayed. No extra hoops for participants to jump through. Swag is great for brand recognition, but you could choose to give away something else entirely. Digital products, physical products, and gift cards are just a few examples you could use. But before deciding on running your own giveaway, it’s recommended that you look into the legal implications before doing so. I’m not a legal professional, so I can’t offer any advice here. This post by Sara Hawkins offers some insights. But speaking to a legal professional about your specific situation is recommended. Want more lead magnet ideas? Check out Alee King’s post over at Funnel Overload (it includes 30+ ideas with examples). By now, you should have some ideas of what your lead magnet could be. Now, lets talk about the tools you’ll need to create and host your lead magnet. The exact tool(s) you need will depend on the type of content you want to create. Below, we’ll look at PDF documents, images, audio and video as they’re the most popular content types used for lead magnets. If you write blog posts using a typical word processing tool, you’ll likely have what you need to create a PDF document. I recommend using Google Docs because they have excellent collaboration features, revision tracking and allow you to access your documents from any device. And it’s free! That said, tools like Microsoft Word, Microsoft Powerpoint, OpenOffice and LibreOffice all have the ability to export regular documents to the PDF format. Google Docs is ideal if you want to turn a basic article into a PDF, but you can make something far better by using Google Slides – Google’s version of Microsoft Powerpoint. Want to save time and still create a smart, branded lead magnet? 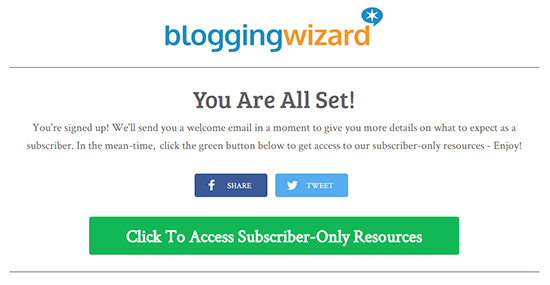 Earlier I mentioned the resource library that Blogging Wizard subscribers get access to when they sign up. Inside we have two different lead magnet templates created using Google Slides. A full tutorial on how to customize the templates is included (I’ll show you how to get access in a moment). 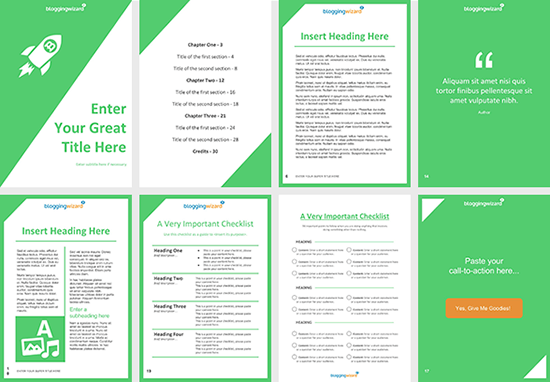 And you get multiple variations of some page types – including the checklist templates. This means you can use the templates for ebooks, guides, and checklists. You could even use it to create a guide that comes with its own checklist. Head over to this page and sign up. You’ll be sent a confirmation email with a link to click. Once your email address is confirmed, you’ll be given access to the library – scroll to the bottom, and you’ll find the lead magnet templates. You’ll get access to the rest of our resources and updates about new blog posts. If you want out – just use the unsubscribe button at the bottom of any of our emails. Already subscribed? You’ll find the URL to this page in your welcome email. If you need help, drop me an email. You could upload files directly to your web host, but I don’t recommend it. Leave your web host to do what it does best – hosting your website. Instead, use a third party service like Dropbox or Google Drive to host your PDF files. I particularly like Google Drive because it integrates seamlessly with Google Docs, making it easy to create documents and host them – within one platform. 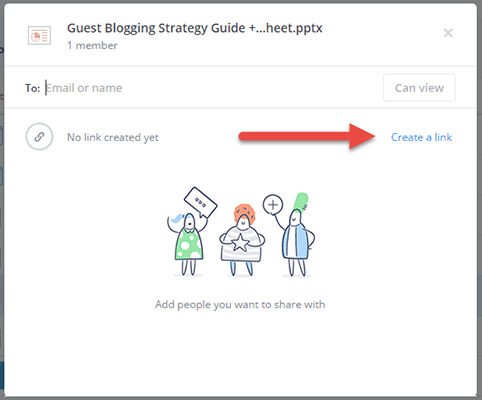 Once you click the ‘Get shareable link’ option, you’ll be given a direct link, and you can choose what people can do with the document, once they have the link. It defaults to ‘anyone with the link can view’ – it’s critical that you leave the setting as is and not give anyone editing privileges. If you choose to go with Dropbox, you’ll be able to get a shareable link too. Just log in to the app and look for the ‘share’ button towards the right-hand side when you hover over a file. There are a crazy amount of image editing tools available on the web, and a lot of them are free. Or at least, they have free plans available. Elna Cain covers a selection of tools worth checking out in this post. Canva – This is one of the most user-friendly image creation tools you’ll find. Canva comes loaded with images and templates – most are free, but you get the option to buy others from within the platform. There’s a free-forever plan that isn’t as limited in terms of features, as you might expect. Paid plans start at 12.95/month and unlock extra features. Stencil – The one issue I have with Canva is that it occasionally has random glitches and goes down because so many people use it. Stencil doesn’t seem to have that issue. The features aren’t as extensive, but I find I’m able to create images faster – the interface is fantastic. There’s a free-forever plan that allows you to create 10 images/month and offers limited backgrounds and icons. Paid plans start at $9/month (paid annually). Infogr.am – Want to turn data into a pretty visual? This tool is for you. A free plan is available with basic features. They’ll likely be enough for your needs, but if you want to upgrade, paid plans start at $25/month. Piktochart – This is a web-based tool for creating charts in the form of infographics. A free plan is available, but you can get extra features with paid plans that start at $15/month. In the previous section, we discussed hosting PDF documents using Dropbox or Google Drive. Either of these options would be suitable for images as well. Okay. If you want to use audio for your lead magnet, you’ll need 3 different things. The quality of your audio recording will partly be determined by the quality of your microphone. You could use a headset if you have one but a dedicated microphone like a Blue Snowball would be more suitable. You can pick them up on Amazon for under $50. Or you can go a step further and get a Blue Yeti microphone for just over $100. There are a bunch of fancy audio production software packages on the market, but you won’t need anything like that complex. A free tool like Audacity should be sufficient. You need somewhere on the web to host your audio files. Never use your web host for this because bandwidth requirements are significant. Mix Cloud – DJ’s and artists primarily use Mixcloud, but it’s also available to podcasters too. The best news is that you get no limits on uploads. The free account does include adverts, but you can remove those for around $5/month. Sound Cloud – This is a music social network that’s been adopted by a lot of podcasters. It’s what you might expect Twitter to be if it swapped out status updates for music. You can upload 3 hours of audio with a free plan. Paid plans start at around $5/month which give you more upload time and extra features. Libsyn – Very popular among podcasters. Plans start at $5/month. For that, you’ll get 50mb of monthly storage, a podcast RSS feed (if you need it) and more. Each of the above platforms can do the job, but Mixcloud stands out as offering the most value for money, given that they have no upload limits. Similar to audio, there are several steps to creating video content. Below, I’ll walk you through several approaches to recording video, choosing editing software and finding a platform to host your videos. First, you need to decide which type of video you want to record. You could go for a video where you’re in shot – a talking head video or whiteboard style video maybe. Or you could use a screencast of a presentation. This is a popular option because you can display slides that help your subscribers follow along, and serve as prompts for yourself. What gear/software will you need? For a regular video, you’ll need a video camera, smartphone or webcam. For a screencast, you’ll need a microphone. One of the microphones we talked about earlier will work, but you could use a headset microphone. You’ll also need specialist software that allows you to record what’s happening on your screen. You could use Jing (free but limited to 5 minutes), Camtasia (costs around $199, free trial available) or use Screencast O Matic (free version adds watermarks; unlock full features for $15/year). A great free alternative for Chrome users is Useloom – it works via a Chrome Extension making it quick and easy to create videos. I haven’t tried this yet but I’m told that it gets a bit buggy when recording longer videos. You’ll need software to edit your videos – a free tool like Blender should be enough. But, if you get Camtasia for recording screencasts, that can double up as your editing tool. It has a boat load of other features too – including transitions, annotations, animations and effects. You can even connect up your webcam and add a video of yourself to your screencast – it’s a great personal touch. Once your video is ready, you’ll need somewhere to host it. Video requires a lot more bandwidth than audio, so the need for a decent platform to host it (that isn’t your website) is critical. YouTube and Vimeo are popular options – but the main issue with these platforms is the possibility of ads distracting your viewers. Vimeo has a pro version for $17/month (billed annually) that removes ads and gives you 20GB of upload space each week. And you get tools that allow you to choose who sees your videos, and sell them if you’d like to. Another great option is Wistia – it’s designed specifically for businesses and; no ads! They have a free plan that gives you a 3 video limit, and 200GB bandwidth limit. If you need any more than that, it’ll get pricey, so you have to be able to justify the cost ($100/month and above for paid plans). Now that you’ve got your lead magnet created, and you know how you’ll host it – you need to deliver it to your subscribers. Whichever hosting method you use, you should have a link that you can share with your subscribers. The method you use for delivering your lead magnet will depend on whether you want to deliver an individual lead magnet or a collection of resources. We’ll cover both methods below along with the basics of getting your email provider setup (if you haven’t already) – let’s dive in! The below methods are based on using double confirmed opt-in. This means your subscribers have to click a ‘confirmation link’ in an email sent by your email service provider. This helps to ensure they really want to be on your list & stops most bots from joining your list – and in turn, improves your open rates/click-through rates. Alternatively, you could use single confirmed opt-in. It makes lead magnet delivery easier, but it can also impact open rates unless you have an automation sequence weed out unengaged subscribers & bots. Most email providers will default to double confirmed opt-in, however, some marketing automation platforms may default to single confirmed opt-in. If you’re unsure, check with the email provider that you use. If you haven’t signed up for an email service provider yet, now is the time. Some of the providers below have free plans so you can get up and running right away. Mailerlite – Free forever plan available for up to 1,000 subscribers with no limits on features. And the features you do get are impressive – including a visual automation builder. Cheaper than MailChimp on paid plans. MailChimp – Free plan supports up to 2,000 subscribers but heavily limits features. For the purposes of setting up your lead magnet delivery – a free plan will suffice. Automation features are available, but they feel clunky to me. Plenty of features but can take a while to find your way around. ActiveCampaign – No free plan here but plans start at $9/month. It has extremely powerful automation functionality that you might expect to find in enterprise level tools – only a lot cheaper. The only downside is the learning curve involved in getting to grips with the platform. ConvertKit – Prices start at $29/month which may sound expensive but its purpose built for delivering lead magnets, no matter how many you have. It’s built to be simple which is great, but that’s a double-edged sword because some features you may expect to find are basic or just not there. Still, the lead magnet functionality is ground-breaking. And you can build forms/landing pages from within the platform. I’ll talk about this platform in more detail a bit later on. When you’ve only got one lead magnet, sending it to your subscribers is VERY simple. It’s as simple as adding the download link to the email you send your subscribers when they first sign up and adding it to your confirmation page. Most email providers would require you to add one email to an autoresponder (or automation sequence). You’d need to set it to be sent to your subscribers immediately after they sign up. And of course, write out a nice welcome email with your lead magnet’s download link. You’ll also need to add the download link to your confirmation page (this is the page your subscribers are directed to once they confirm their email address). You can stick to the one created by your email provider, but you’ll get more control with a custom page. Exactly how you set the custom URL for your confirmation page will depend on your email provider – if you’re unsure, consult their documentation. And I’d recommend doing the same with your thank you page for consistency. It’s also worth noting that some email providers call these pages by different names. This should prompt subscribers to check their inbox for your confirmation email, and encourage them to click the link. If they don’t, they won’t get your lead magnet. Makes the process look easy, right? You could also provide a contact page URL or email address for subscribers to contact you on if they need help. This is the page you’ll use to deliver your lead magnet. You could also add a note about subscribers adding your email address to their email whitelist, so any other goodies you send them won’t be missed. One important thing I have to point out if you use this template is about the share buttons. The share buttons shouldn’t share your confirmation page URL. Instead, they should share the URL of a lead generation page where new visitors can subscribe. If your lead magnet is a collection of resources, I recommend creating a static page where subscribers can download each resource. Your confirmation page should link to a dedicated download page, rather than housing each lead magnet. We’ll discuss this in more depth in the next section. Delivering multiple lead magnets takes more setup work, but there are a bunch of tools that make it far easier. Earlier on I mentioned the resource library/vault I offer to Blogging Wizard subscribers. When people sign up, they get access to a secret page that contains all of my lead magnets. I’ve seen some brands require visitors to subscribe for each resource they download – and often fill out long forms. While I can see the benefits of this from a marketing perspective, it’s not good from a user experience perspective. It feels like forcing people to jump through too many hoops. So, I created a central page where all of my resources can be accessed at once. It’s not the perfect delivery method by any means, but it does make the process easier. And while it’s helpful for those that want everything I have to offer – it’s not as straightforward for those who sign up for a specific resource. I’ll explain how to send out lead magnets to your subscribers individually in a moment. Visitor subscribes via an opt-in form or this landing page. Visitor is directed to a thank you page with instructions on how our sign up process works (and asks them to whitelist our email address). My email platform sends out a confirmation email. Visitor clicks on a confirmation link. Visitor is taken to a confirmation page with a link to the private page. A welcome email is sent out which also includes a link to the private page. I created the page above using the Beaver Builder plugin while I was testing it out for a post. Although, you can create a similar page using Thrive Architect. And if you use Thrive Leads for your opt-in forms, it makes sense to use Thrive Architect because they integrate together perfectly. But the reality is that you don’t need to complicate the process by using a page builder plugin at all. Just a regular page on your blog with links to each lead magnet will be fine. If you use WordPress, you could password protect the page to ensure that only subscribers can gain access. Make it a simple password and include it in your welcome email. I avoided doing this to make things easier for my subscribers – then another marketer linked to it from a popular website. Eventually, I had 50+ domains linking to my secret page. Oops! Also, if you ever plan on using goal tracking in Google Analytics or any other analytics tool, I recommend that you avoid using your secret page as the custom confirmation page URL in your email provider. Goal tracking allows analytics tools to track which traffic sources are converting for you. Once setup, you’ll be able to see conversion rates & how many conversions you’re getting. Check out my tutorial to set this up in Google Analytics to get started. Why? Because each time someone accesses your confirmation page, they’d skew your data. Sending the exact lead magnet that someone signs up for, via email is a great way to save confusion and ensure that nobody has to hunt around. But, you will need a tool to help you here. With Thrive Leads, you do have to integrate a third party email delivery service. But, the service you use needs to support transactional email. Most emails are sent to an email list. Transactional email is different because it involves one-on-one emails. Even though you’re sending a freebie, it still counts as a transaction which a lot of regular email providers such as GetResponse and AWeber don’t support. Thrive integrates with a number of transactional email services, but Mailgun, Sendinblue, and Sparkpost all have free tiers. For most situations, you shouldn’t need to upgrade to a paid account. But, I would recommend checking the pricing tiers for each platform before you sign up. Another option here is Leadpages which doesn’t require integration with any third party services. Although, it is pricey – coming in at $37/month. So you’ll need to be able to justify the cost – Thrive is a lot cheaper. Due to how API integrations work with email providers such as MailChimp etc., tools like Thrive Leads and Leadpages have no way of sending emails after someone has confirmed their email address. This isn’t an issue if you use single confirmed opt-in, but if you use double confirmed opt-ins, it might be. For example, when you use either of these tools, people will receive a download email and a confirmation email at the same time. In a way this is a good thing – it means only those that truly want to be on your list will confirm their email address. But it will mean sacrificing some subscribers. Then list out the resources. But, if you follow this process you’ll need to use the ‘static page method’ that we discussed above to ensure that you have a central location where subscribers can access each lead magnet. There’s one more alternative that I’ve left till last because it would mean migrating your email list (if you have one already setup). That alternative is ConvertKit, which I mentioned briefly earlier. 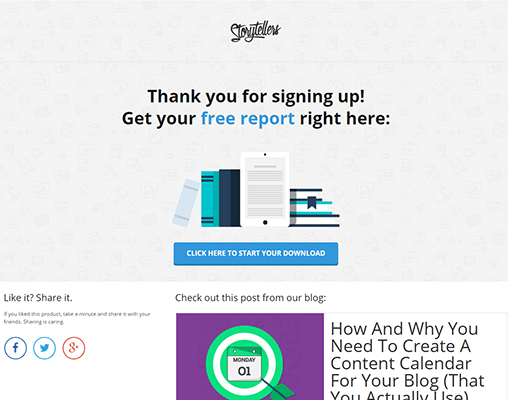 ConvertKit is an email marketing service provider that is designed specifically for bloggers. It’s the only platform I’ve found that makes it easy to deliver multiple lead magnets individually. Well, without setting up any email automation like you might need to with a platform like ActiveCampaign or Drip. Inside the platform, you create forms. And for each form, you can set up a confirmation email that sends out your lead magnet. When someone downloads your lead magnet, they also confirm their subscription. From what I can tell, there’s no limit on the number of forms/lead magnets you can setup. I must point out that ConvertKit is more expensive than some email providers. Although in some ways it can work out cheaper because each email address is only counted once (unlike how MailChimp/AWeber would count it multiple times if you had several lists setup). 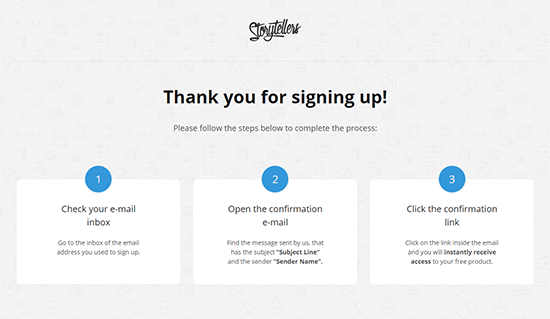 You can create both opt-in forms and landing pages. They don’t have all the features you’d get with a dedicated opt-in form/landing page tool, but they’re still helpful. Certain features you might take for granted in other email providers are basic or non-existent. But it’s a lot easier to setup, and how it handles lead magnets is amazing. By now I’m sure you may have heard of GDPR. It’s an EU law that has global implications. And this will definitely impact how you choose to deliver your lead magnets. 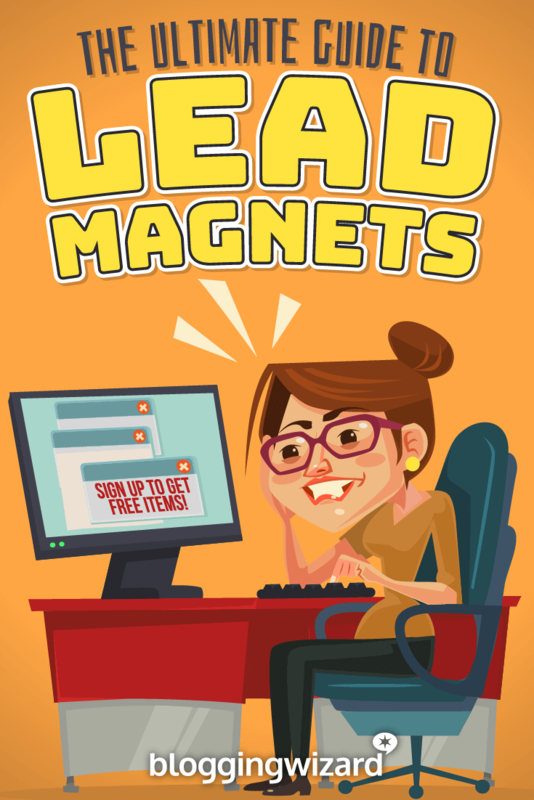 If someone signs up for a lead magnet, they need to consent to also receiving emails from you. Double confirmed opt-in is useful here. But single opt-in can still work providing clear consent is given – some tools like Thrive Leads allow you to add checkboxes to forms which will help with this. However, this is a complex law and there’s no “one glove fits all” type solution to compliance because every situation is slightly different. I’d recommend researching into the topic, and gaining an understanding of GDPR so you can work towards becoming compliant. If in doubt, it’s best to consult a lawyer. Phew – Thanks for sticking with me! I’ve shared a lot of information with you today, and now it’s time to start implementing it. Use the examples to inspire the concept for your lead magnet – then put together a plan and map out how your lead magnet will take shape. Get any necessary content ready in advance and dive into the tools we talked about for creating, and hosting your lead magnet. Once your lead magnet is ready, and hosted – it’s time to decide on how you want to deliver it to your subscribers.